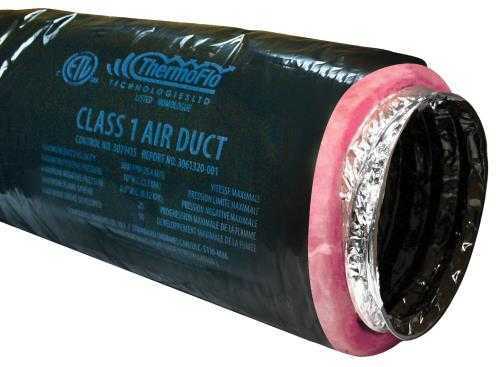 ThermoFlo Technologies SRB series is an industrial quality insulated duct manufactured tough for consumers' and installers' peace of mind. It consists of a three ply polyester laminate, fiberglass reinforced scrim, galvanized spring steel wire, wrapped with fiberglass insulation, which provides an outstanding combination of strength and tear resistance. A heavy duty fire retardant black polyethylene vapor barrier adds extra durability. The insulation reduces noise, heat loss and condensation.